Buy MoorHNA a Coffee. ko-fi.com/moorhna - Ko-fi ❤️ Where creators get paid by fans, with a 'Buy Me a Coffee' button. My name is Jamilah! 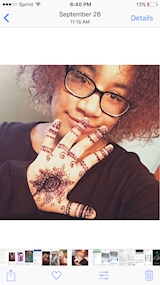 I’m an art activist that helps people de colonize their bodies and heal their minds through Moor and Amazigh and indigenous Tribal body art symbology through the mediums of organic dyes known as Henna and Jagua! Secured Payments. Support goes to MoorHNA's account. Upgrade MoorHNA to a yearly Gold Membership with a one-time payment.